Where can I find technical details for all of the CF® dyes? See our CF® Dye Quick Reference Table for a list of dyes and summary of their features. Our CF® Dye Selection Guide has more detailed information on each CF® dye, and ordering information for our various CF® dye product lines. You can download CF® dye normalized absorption and emission data in Excel format. What are the chemical structures of CF® dyes? The exact chemical structures of CF® dyes are currently confidential but will be fully disclosed at a later stage when pending patents become granted. In general terms, the structure of a CF® dye may be divided into two parts: a) dye core structure (i.e. the aromatic ring skeleton that defines the dye’s color or absorption/emission wavelengths), and b) core structure-modifying elements. 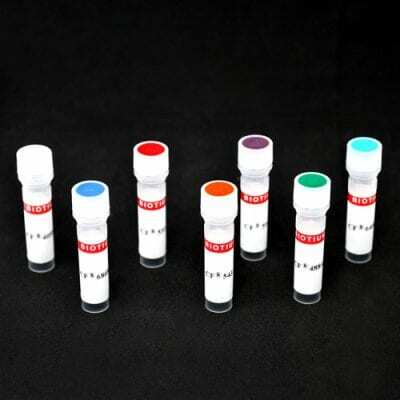 At present, CF® dyes bear the core structures of coumarin, pyrene, rhodamine or cyanine dyes. Blue fluorescent CF® dyes are based on coumarin or pyrene dye core structure, while green to near-IR CF® dyes are based on either cyanine or rhodamine dye core structures. Core structure-modifying elements refer to various chemical attachments to the core structure and are a key aspect of the CF® dye invention that makes CF® dyes superior to other commercial dyes. Annexin V fluorescent conjugates can be used to detect apoptotic cells. The human anticoagulant Annexin V is a 35-36 kDa calcium-dependent phospholipid-binding protein with high affinity for phosphatidylserine (PS). In normal viable cells, PS is located on the inner leaflet of the cytoplasmic membrane. 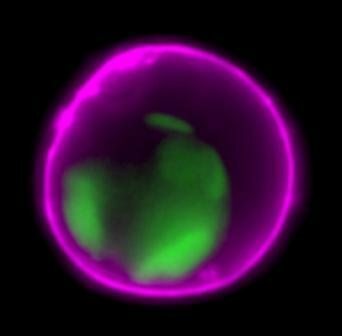 In apoptotic cells, however, PS is translocated from the inner to the outer leaflet of the plasma membrane, where it can be detected by fluorescently labeled Annexin V.
We also offer Annexin V Conjugates, Azide-Free and Lyophilized in colors ranging from UV to far-red for live cell staining, and Near-IR CF® Dye Annexin V (also lyophilized and preservative-free), compatible with small animal NIR in vivo imaging. Annexin V is also available with other probes in our Apoptotic and Necrotic Staining Kits. See our full selection of Cell Viability and Apoptosis Assays. 1. J Immunol Methods 184, 39 (1995). 2. Blood 84, 1415 (1994). 3. Cytometry 43, 134 (2001). 4. FEBS Lett. 203, 99 (1986). 5. Biosci. Rep. 7, 289 (1987). Staurosporine is a potent and cell-permeable inhibitor of a wide variety of protein kinases (1,2) including protein kinase C (IC50 = 0.7 nM), protein kinase A (IC50 = 7 nM), and protein kinase G (IC50 = 8.5 nM). Staurosporine induces apoptosis in human neuroblastoma cells and chick embryonic neurons (3,4).